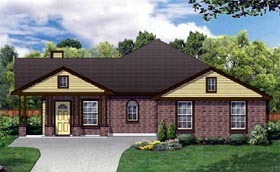 This awesome plan has been updated with a quaint elevation & extra features. Library can be a formal living or 4th bedroom. Oversized family is open to the dining & cook's kitchen. Generous bedrooms, utility & extra storage add value. Double walk-in closet, vaulted ceiling & separate shower make the master suite a dream. Wrap around porch, gables & decorative windows create an Arts & Crafts look.